Heperona 25 mg: Coated Tablets : Box of 30. Heperona 50 mg: Coated Tablets: Box of 30. Heperona 25 mg: Each tablet contains: Eplerenone: 25 mg.
Heperona 50 mg: Each tablet contains: Eplerenone: 50 mg. Mechanism of Action: Eplerenone binds to mineralocorticoid receptors and blocks the binding of aldosterone, a component of the renin-angiotensin-aldosterone system (RAAS). Aldosterone synthesis, which takes place primarily in the adrenal glands, is modulated by several factors, including angiotensin II and non-RAAS mediators, such as adrenocorticotropic hormone (ACTH) and potassium. Aldosterone binds to mineralocorticoid receptors in both epithelial (e.g. kidney) and nonepithelial (e.g. heart, blood vessels, brain) tissues and increases blood pressure by inducing sodium reabsorption and possibly also through other mechanisms. Eplerenone binds selectively to recombinant human mineralocorticoid receptors relative to its binding to recombinant human glucocorticoid, progesterone, and androgen receptors. Eplerenone has been shown to produce sustained increases in plasma renin and serum aldosterone levels, consistent with inhibition of the negative regulatory feedback of aldosterone on renin secretion. The resulting increased plasma rennin activity and the higher circulating levels of aldosterone do not overcome the effects of eplerenone. General: Eplerenone is primarily cleared by cytochrome P450 (CYP) 3A4 metabolism. The mean elimination half-life is 4-6 hours; steady state is reached within 2 days. Absorption is not affected by food. CYP3A4 inhibitors (e.g. ketoconazole, saquinavir) increase blood levels of eplerenone. Absorption and Distribution: Mean peak plasma concentrations of eplerenone are reached approximately 1.5 hrs following oral administration. The absolute bioavailability of eplerenone is unknown. Both Cmax and AUC are dose proportional in the 25-100 mg dose range and less than proportional at doses above 100 mg. The plasma protein binding of eplerenone is about 50% and it is primarily bound to alpha 1-acid glycoprotein. The apparent volume of distribution ranges from 43-90 L. Eplerenone does not preferentially bind to red blood cells. Metabolism and Excretion: Eplerenone is primarily metabolized by CYP3A4. No active metabolites of eplerenone have been identified in human plasma. Less than 5% of an eplerenone dose is recovered as unchanged drug in the urine and feces. Following a single oral dose of radiolabeled drug, approximately 32% of the dose was excreted in the feces and approximately 67% was excreted in the urine. The mean elimination half-life of eplerenone is approximately 4 to 6 hours. The apparent plasma clearance is approximately 10 l/hr. Age, Gender, Race: The pharmacokinetics of eplerenone at a dose of 100 mg once daily have been studied in the elderly (≥65 years), in males and females, and in Blacks. No significant pharmacokinetic differences were observed between genders. In elderly subjects, the Cmax and AUC of eplerenone at steady state increased by 22% and 45% respectively, compared with younger subjects (18 to 45 years). In Blacks, also at steady state, the Cmax and AUC of eplerenone decreased by 19% and 26%, respectively..
Renal Impairment: The pharmacokinetics of eplerenone were evaluated in patients with varying degrees of renal impairment and in hemodialysis patients. Compared with controls, steady state AUC and Cmax were increased by 38% and 24%, respectively, in patients with severe renal impairment and were decreased by 26% and 3%, respectively, in patients undergoing hemodialysis. No correlation was observed between plasma clearance of eplerenone and Clcr. Eplerenone is not removed by hemodialysis. Hepatic Impairment: The pharmacokinetics of eplerenone 400 mg have been investigated in patients with moderate (Child-Pugh Class B) hepatic impairment. Compared with normal subjects, steady state Cmax and AUC of eplerenone were increased by 3.6% and 42%, respectively. Heart Failure: The pharmacokinetics of eplerenone 50 mg were evaluated in patients with NYHA Class II-IV heart failure. Compared with healthy controls matched for gender, age and weight, steady state AUC and Cmax of eplerenone were 38% and 30% higher, respectively, in heart failure patients. Consistent with these results, a population pharmacokinetic analysis based on a subgroup of patients from a published study indicated that eplerenone clearance in heart failure patients was similar to that in healthy elderly subjects. Treatment of Congestive Heart Failure Post-Myocardial Infarction: Heperona is indicated to improve survival in stable patients with left ventricular systolic dysfunction (ejection fraction ≤40%) and clinical evidence of congestive heart failure after an acute myocardial infarction. Hypertension: Heperona is indicated for the treatment of hypertension. Heperona may be used alone or combined with other antihypertensive drugs. 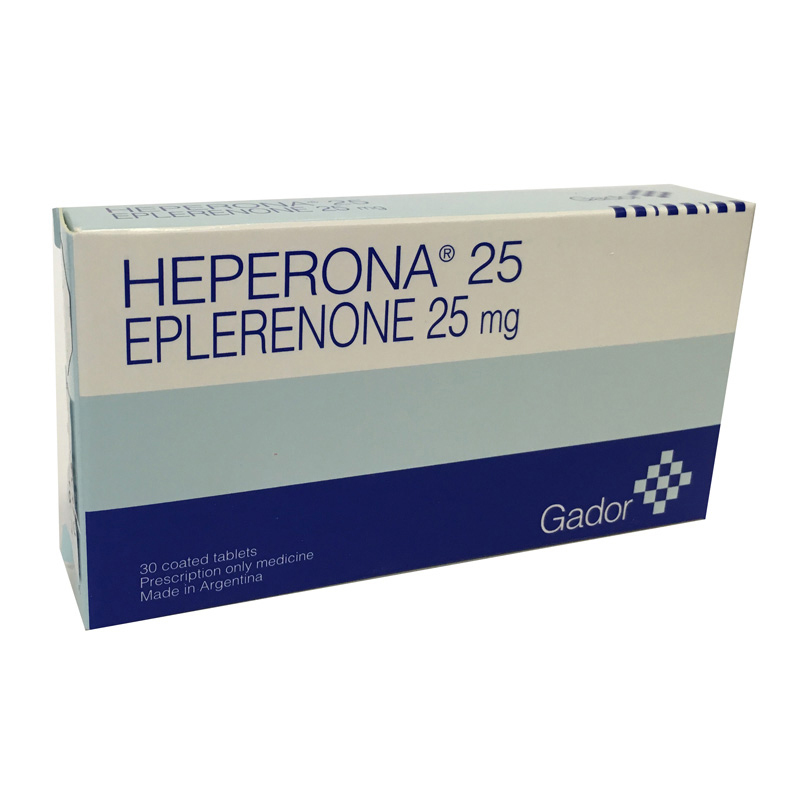 Heperona is contraindicated in all patients with any of the following conditions: hypersensitivity to eplerenone or to any of the excipients in the formulation, serum potassium >5.0 mmol/l at the initiation of treatment, moderate to severe renal impairment (Clcr <50 ml/min), severe hepatic impairment (Class C Child-Pugh), concomitant treatment with potassium-sparing diuretics, potassium suplements or strong CYP3A4 inhibitors (e.g. itraconazole, ketoconazole, ritonavir, nelfinavir, clarithromycin, telithromycin, nefazodone). Also, Heperona is contraindicated for the treatment of hypertension in patients with any of the following conditions: type 2 diabetes with microalbuminuria, serum creatinine >2.0 mg/dl in males or >1.8 mg/dL in females, Clcr <50 mL/min, concomitant administration of potassium supplements or potassium-sparing diuretics (e.g. amiloride, spironolactone, or triamterene). Hyperkalemia: due to its mechanism of action, eplerenone can cause hyperkalemia. Serum potassium levels should be monitored in all patients at the start of treatment and upon each dose adjustment. Periodical monitoring is recommended thereafter, especially in patients at risk of developing hyperkalemia, such as (elderly) patients with renal impairment and diabetic patients. Patients taking eplerenone should not to use potassium supplements, due to the increased risk of hyperkalemia. Eplerenone dose reduction has been shown to decrease serum potassium levels. One study has shown that adding hydrochlorotiazide to eplerenone therapy compensated for the increase in serum potassium levels. Impaired Renal Function: Potassium levels should be monitored regularly in patients with impaired renal function, including diabetic patients with microalbuminuria. The risk of hyperkalemia increases with decreasing renal function. Limited data from a clinical trial in patients with type 2 diabetes and microalbuminuria showed an increased occurrence of hyperkalemia in the small number of patients studied. Therefore, such patients should be treated with caution. Eplerenone is not removed by hemodialysis. Impaired hepatic function: No elevations of serum potassium above 5.5 mmol/L were observed in patients with mild to moderate hepatic impairment (Child-Pugh Class A or B). Serum electrolyte levels should be monitored in these patients. The use of eplerenone in patients with severe hepatic impairment has not been studied and is therefore contraindicated. CYP3A4 inducers: Eplerenone should not be administered concomitantly with strong CYP3A4 inducers. Lithium, cyclosporin and tacrolimus should be avoided during treatment with eplerenone. Lactose: Heperona tablets contain lactose, so they should not be administered in patients with rare hereditary disorders of galactose intolerance, Lapp lactase deficiency or glucose-galactose malabsorption. Pediatric use: The safety and effectiveness of Heperona in pediatric patients have not been determined. Geriatric use: No overall differences in safety or effectiveness were observed between elderly and younger patients with congestive heart failure post-myocardial infarction. Teratogenic effects: Embryo-fetal development studies have been conducted with doses up to 1000 mg/kg/day in rats and 300 mg/kg/day in rabbits (exposure levels up to 32 and 31 times the human AUC for the 100 mg/day therapeutic dose, respectively). No teratogenic effects were seen in rats or rabbits, although decreased body weight in maternal rabbits and increased rabbit fetal resorptions and postimplantation loss were observed at the highest administered dosage. Given that animal reproduction studies are not always predictive of human response, Heperona should only be used during pregnancy if the potential benefit justifies the potential risk to the fetus. Potassium-sparing diuretics and potassium supplements: due to the increased risk of hyperkalemia, eplerenone should not be administered to patients receiving potassium-sparing diuretics or potassium supplements. Potassium-sparing diuretics can potentiate the effect of antihypertensive drugs and/or other diuretics. Lithium: There are no drug interaction studies of eplerenone with lithium. However, there have been reports of lithium toxicity in patients receiving lithium concomitantly with diuretics and ACE inhibitors. Coadministration of eplerenone with lithium is not recommended. Should such combined therapy be necessary, serum lithium levels should be monitored frequently. Cyclosporin, tacrolimus: Cyclosporin and tacrolimus may lead to renal impairment and increased risk of hyperkalemia. Concomitant administration of eplerenone with cyclosporin or with tacrolimus should be avoided. Should such combined therapy be necessary, serum potassium levels and renal function should be monitored frequently. NSAIDs: Treatment with NSAIDs may cause acute renal failure by direct effect on glomerular filtration, especially in patients with increased risk for this condition (elderly and/or dehydrated patients). Patients receiving eplerenone concomitantly with NSAIDs should be properly hydrated and renal function should be assessed before initiation of therapy. Trimethoprim: Concomitant administration of trimethoprim with eplerenone increases the risk of hyperkalemia. Serum potassium levels and renal function should be monitored, especially in patients with renal impairment and in elderly patients. ACE inhibitors, angiotensin II receptor (ARA II) antagonists: Caution should be exercised when administering eplerenone concomitantly with ACE inhibitors or angiotensin II receptor antagonists, as such combination of drugs may increase the risk of hyperkalemia in patients with increased risk of renal impairment, such as the elderly. Serum potassium levels and renal function should be monitored frequently. Alfa-1 blockers (e.g. prazosin, alfuzosin): Combination of alfa-1 blockers with eplerenone therapy potentially increases the hypotensive effect and/or postural hypotension. Patients under such combined therapy should be clinically monitored for postural hypotension. Tricyclic antidepressants, neuroleptics, amifostine, baclofen: Concomitant administration of any of these drugs with eplerenone may potentially decrease the antihypertensive effect and the risk of postural hypotension. Glucocorticoids, tetracosactide: Coadministration of any of these drugs with eplerenone may potentially decrease the antihypertensive effect. In vitro studies indicate that eplerenone is not an CYP1A2, CYP2C19, CYP2C9, CYP2D6 or CYP3A4 inhibitor. Eplerenone is not a substrate or an inhibitor of P-glycoprotein. Digoxin: Systemic exposure to digoxin (AUC) increases by 16% when administered concomitantly with eplerenone. Caution should be exercised then digoxine dosage approaches the upper limit of the therapeutic dose range. Warfarin: No clinically significant drug-drug pharmacokinetic interactions were observed when eplerenone was administered with warfarin. Caution should be exercised then warfarin dosage approaches the upper limit of the therapeutic dose range. CYP3A4 substrates: No significant pharmacokinetic interactions were observed when CYP3A4 substrates such as cisapride and midazolam were administered concomitantly with eplerenone in pharmacokinetic studies. - Strong CYP3A4 inhibitors: Significant pharmacokinetic interactions may occur when eplerenone is administered concomitantly with CYP3A4 inhibitors. A strong CYP3A4 inhibitor (ketoconazole 200 mg administered twice daily) resulted in a 441% increase in the AUC of eplerenone. Concomitant use of eplerenone with strong inhibitors of CYP3A4, such as ketoconazole, itraconazole, ritonavir, nelfinavir, clarithromycin, telithromycin or nefazodone, is contraindicated. - Mild to moderate CYP3A4 inhibitors: coadministration of eplerenone with erythromycin, saquinavir, amiodarone, diltiazem, verapamil and fluconazole led to significant pharmacokinetic interactions with rank order increases in AUC ranging from 98% to 187%. Therefore, eplerenone dosage should not exceed 25 mg/day when administered concomitantly with mild to moderate CYP3A4 inhibitors. - Grapefruit juice caused only a small increase (about 25%) in eplerenone exposure. CYP3A4 inducers: Coadministration of St. John’s Wort (a strong CYP3A4 inducer) with eplerenone caused a 30% decrease in the AUC of eplerenone. More pronounced decreases in the AUC of eplerenone may occur when stronger CYP3A4 inducers, such as rifampin, are concomitantly administered. Due to the risk of decreased efficacy of eplerenone, the concomitant use of eplerenone with CYP3A4 inhibitors (rifampin, carbamazepine, phenytoin, phenobarbital, St. John’s Wort) is not recommended. Antacids: results from a pharmacokinetic clinical study suggest that no significant interactions shoud be expected when antacids are coadministered with eplerenone. There are no studies on the effect of eplerenone on the ability to drive or use machines. Eplerenone does not cause drowsiness or impairment of cognitive function; however, the fact that dizziness may occur during eplerenone treatment should be taken into account when driving vehicles or operating machines. Pregnancy: There are no adequate and well-controlled studies of eplerenone in pregnant women. Heperona should only be used during pregnancy if the potential benefit justifies the potential risk to the fetus. Lactation: The concentration of eplerenone in human breast milk following oral administration is unknown. However, preclinical data show that eplerenone and/or its metabolites are present in rat breast milk (0.85:1 [milk/plasma] AUC ratio) obtained after a single oral dose. Peak concentrations in plasma and milk were obtained 0.5-1 hr after dosing. Rat pups exposed by this route developed normally. Given that several drugs are excreted in human milk and that the potential for adverse effects on the nursing infant is unknown, a decision should be made whether to discontinue nursing or discontinue eplerenone, taken into consideration the importance of the drug to the mother. In a study on efficacy and survival in patients with congestive heart failure post acute myocardial infarction, the overall incidence of adverse events reported with eplerenone (78.9%) was similar to placebo (79.5%). Discontinuation rate due to adverse events was 4.4% for the eplerenone treatment group and 4.3% for the placebo group. Adverse events observed in the above-mentioned study with suspected relationship to treatment and in excess of placebo, or events that are serious and significantly in excess of placebo are described below. Adverse events are listed by body system and absolute frequency. Frequencies are defined as: frequent > 1/100, < 1/10; infrequent > 1/1,000, < 1/100. Blood and lymphatic system disorders: Infrequent: eosinophilia. Metabolism and nutrition disorders: Frequent: hyperkalemia. Infrequent: hyponatremia, dehydration, hypercholesterolemia, hypertriglyceridemia. Nervous system disorders: Frequent: dizziness. Infrequent: headache. Cardiac disorders: Infrequent: myocardial infarction, left cardiac failure, atrial fibrillation. Vascular disorders: Frequent: hypotension. Infrequent: arterial thrombosis in the lower extremities, postural hypotension. Respiratory, thoracic and mediastinal disorders: Infrequent: pharyngitis. Gastrointestinal disorders: Frequent: diarrhea, nausea. Infrequent: vomiting, flatulence. Skin and subcutaneous tissue disorders: Frequent: exanthema. Infrequent: pruritus, increased sweating. Unknown frequency: angioedema. Musculoskeletal and connective tissue disorders: Infrequent: back pain, muscle cramps in the lower extremities. Renal and urinary disorders: Frequent: abnormal renal function. Reproductive system and breast disorders: Infrequent: gynecomastia. General and administration site disorders: Infrequent: asthenia, malaise. Laboratory investigations: Infrequent: increased blood urea nitrogen (BUN), increased creatinine. Congestive Heart Failure Post-Myocardial Infarction: The recommended dose of Heperona is 50 mg once daily. Treatment should be initiated at 25 mg once daily and titrated to the recommended dose of 50 mg once daily, preferably within 4 weeks, as tolerated by the patient. Heperona may be administered with or without food. Serum potassium levels should be monitored before starting treatment with Heperona, within the first week and one month after the beginning of theapy or dose adjustment, and periodically thereafter. Additional monitoring may be appropriate depending on the individual patient characteristics and serum potassium levels. If Heperona has been withheld due to serum potassium levels ≥ 6.0 mEq/l, treatment with Heperona may be restarted at 25 mg every other day once serum potassium levels have fallen to <5.5 mEq/l. Hypertension: Heperona can be used alone or combined with other antihypertensive agents. The recommended starting dose of Heperona is 50 mg once daily. The full therapeutic effect of Heperona is apparent within four weeks. For patients with an inadequate blood pressure response to 50 mg once daily, Heperona dosage should be increased to 50 mg twice daily. Dosages of Heperona higher than 100 mg are not recommended since they do not have a greater effect on blood pressure and/or are associated with an increased risk of hyperkalemia. No adjustment of the starting dose is recommended in the elderly or in patients with mild-to-moderate hepatic impairment. For patients receiving mild CYP3A4 inhibitors (e.g., erythromycin, saquinavir, verapamil, and fluconazole), the starting dose should be reduced to 25 mg once daily. There are no reports of overdose with eplerenone in humans. It is expected that the most likely manifestation of human overdosage would be hypotension or hyperkalemia. Eplerenone is not removed by hemodialysis. Eplerenone has been shown to bind extensively to charcoal. Should symptomatic hypotension occur, supportive treatment should be instituted. If hyperkalemia develops, standard treatment should be initiated.